From left to right, Dale Lyons for 20 years service, Wayne Bent for 25 years and Gary Warriner for 35 years. Missing from the photo is Ross Burns 10 years of service. 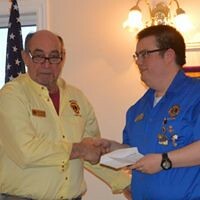 Fifteen members of the Westport Lions Club attended the March 13th meeting to plan an eventful March and April. 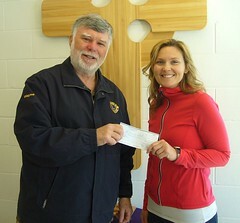 The club passed a motion to give financial support to the music program at St. Edward’s School. The school plans to use the money to purchase ukuleles and provide instruction for their students. The club acted on this request immediately because it was time sensitive. All other applications for financial aid should be submitted in writing to the club by the first of April. The only correspondence other than bills was a request from Rideau District High School to submit a name of the presenter and the amount of our contribution for our graduation award. Lion Dale Lyons volunteered to present our award at this year’s commencement being held on June 27th. Lion Jim Scala updated the club on the new organizational scheme for the treasurer’s position. Lions Jim Scala and Gary Warriner will be co-treasurers. Gary will be cashier and be responsible for all money flow; and Jim will record all transactions on the computer. With so many bills now being paid online the old method to have two members sign each cheque was not practical. This new arrangement will ensure that the club will have two people aware of all financial transactions. Chairperson Bill Garland handed out tickets to all members in attendance for our annual spring cash draw. First prize is $1500 cash and will be drawn at the Lions beach at four p.m. on July 1st. Tickets are now available for five dollars each, or three for ten dollars. The proceeds from this draw will go towards our beach programs. The last week in March will be a very social time for the club. 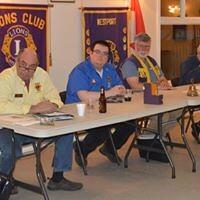 The Elgin Lions Club will make a presentation at our next meeting on March 27th . On Friday, March 29th Lion members with their partners will show their bowling skills at the Elgin Bowling Lanes. On the same night, the Elgin Lioness will host an Elvis tribute night at the Elgin Lions hall. The doors will open at six p.m. and the show will run from seven to nine p.m. Tickets are $15 with light refreshments. A portion of the profit will go to the Elgin/Westport Mobility bus. The meeting ended on a celebratory note. Four Lions were presented with service awards. Lion Gary Warriner has provided service to our community for 35 years. Lion Wayne Bent has been a Lion member for 25 years. 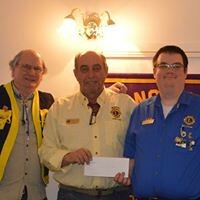 Lion Dale Lyons has devoted 20 years to Lionism and Ross Burns joined our club 10 years ago. The membership gave these gentlemen an enthusiastic round of applause to show our appreciation for their outstanding work in the community over the years.